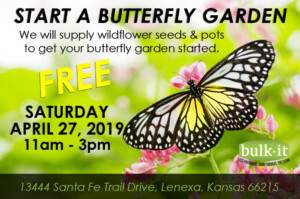 Join us at Bulk It on Saturday, April 27, 2019 from 11am-3pm and start your own butterfly garden! We will supply wildflower seeds and pots to get your butterfly garden started. FREE!